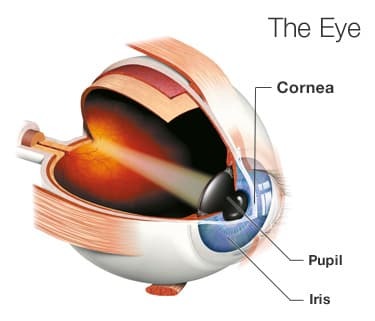 The cornea is a layer on the front of your eye that helps focus light so you can see clearly. If it gets damaged, you might need to have it replaced. The surgeon will remove all or part of your cornea and replace it with a healthy layer of tissue. The new cornea comes from people who chose to donate this tissue when they died. A cornea transplant, also called keratoplasty, can bring back vision, lessen pain, and improve the look of your damaged cornea. The light rays that pass through a damaged cornea can get distorted and change your vision. Your doctor will let you know which specific procedure is best for your condition. If the doctor does a penetrating keratoplasty (PK), all the layers of your cornea get replaced. The surgeon sews the new cornea onto your eye with stitches thinner than hair. You might need this procedure if you have a severe cornea injury or bad bulging and scarring. It has the longest healing time. During deep anterior lamellar keratoplasty (DALK), the surgeon injects air to lift off and separate the thin outside and thick middle layers of your cornea, then removes and replaces only those. People with keratoconus or a corneal scar that hasn't affected the lower layers may have this done. The quality requirements of the donated cornea aren't as strict, and the healing time is shorter than a full thickness transplant. Because your eye itself isn't opened up, it's unlikely the lens and iris could be damaged, and there's less chance of an infection inside your eye. About half of the people who need cornea transplants each year have a problem with the innermost layer of the cornea, the endothelium. Doctors often do this type of surgery to help Fuchs' dystrophy and other medical conditions. Descemet's stripping endothelial keratoplasty (DSEK or DSAEK) is the most common type of endothelial keratoplasty. The surgeon removes the endothelium -- a mere one cell thick -- and the Descemet membrane just above it. Then he replaces them with a donated endothelium and Descemet membrane still attached to the stroma (the cornea's thick middle layer) to help him handle the new tissue without damaging it. Another variation, Descemet's membrane endothelial keratoplasty (DMEK), transplants just the endothelium and Descemet membrane -- no supporting stroma. The donor tissue is very thin and fragile, so it's harder to work with, but healing from this procedure is usually quicker. These surgeries are good options for people with cornea damage only in the inner layer because recovery is easier. Before your operation, your doctor will probably do an exam and some lab tests to check that you're in good general health. You may have to stop taking certain medicines, such as aspirin, a couple of weeks before the procedure. Usually, you'll have to use antibiotic drops in your eye the day before your transplant to help prevent an infection. Most of the time, these surgeries are done as outpatient procedures under local anesthesia. This means you'll be awake but woozy, the area is numb, and you'll be able to go home the same day. Your doctor will do the entire surgery while looking through a microscope. It typically takes 30 minutes to an hour. Afterward, you'll probably wear an eye patch for at least a day, maybe 4, until the top layer of your cornea heals. Your eye will most likely be red and sensitive to light. It might hurt or feel sore for a few days, but some people don't feel any discomfort. Your doctor will prescribe eye drops to bring down inflammation and lower the chances of infection. He may prescribe other medicines to help with pain. He'll want to check your eye the day after surgery, several times during the following couple of weeks, and then a few more times during the first year. You'll have to protect your eye from injury after your surgery. Follow your doctor's instructions carefully. Your cornea doesn't get any blood, so it heals slowly. If you needed stitches, your doctor will take them out at the office a few months later. A corneal transplant is considered a fairly safe procedure, but it is surgery, so there are risks. In about 1 out of every 5 transplants, the body's immune system attacks the donated tissue. This is called rejection. Sometimes it can be treated with medicine, but you may need another transplant with different tissue. Since so little donor tissue is used for DSEK and especially DMEK, there's a much lower risk of rejection with these procedures. Most people who have a cornea transplant get at least part of their vision restored, but each situation is different. It could take a few weeks and up to a year for your vision to improve fully. Your eyesight might get a little worse before it gets better. Your glasses or contact lens prescription may need to be adjusted to include astigmatism correction because the transplanted tissue won't be perfectly round. After the first year, you should see your eye doctor once or twice every year. The donated tissue usually lasts a lifetime. American Academy of Ophthalmology: "About Corneal Transplantation," "Corneal Transplant Surgery Options," "What to Expect When You Have a Corneal Transplant." University of Iowa Health Care, EyeRounds.org: "Information for Patients," "Descemet Stripping Automated Endothelial Keratoplasty (DSAEK)," "Descemet Membrane Endothelial Keratoplasty (DMEK)." Mayo Clinic: "Cornea Transplant: Definition," "Cornea Transplant: Risks." "Corneal Transplant Surgery: A Guide for Patients," University of Michigan, January 2008. Tim Root, Virtual Eye Professor: "Chapter 2: Anatomy of the Eye." Cornea Research Foundation of America: "Endothelial Keratoplasty (DSEK & DMEK)." National Keratoconus Foundation: "About Corneal Transplant Surgery."